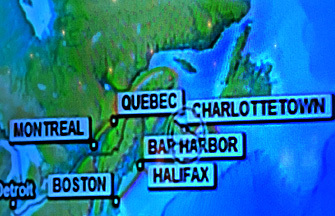 T his trip included the eastern Canadian provinces of Ontario and Quebec, northeast along the St. Lawrence River to Atlantic Ocean and south along coast of Nova Scotia To Maine. The GPS satellite position map (left) aboard the Holland America cruise ship ms Veendam shows some of the cities and general area covered. Disclaimer: This trip was primarily a tour of beautiful Canadian cities. I have included images that fit the informative natural history theme of Wayne's Word. Images of beautiful buildings, churches, statues, people, etc. in this very historic region will be reserved for my Network Solutions website or another website dedicated to slide show presentations. Additional images will eventually appear in the colored tabs above (work in progress). 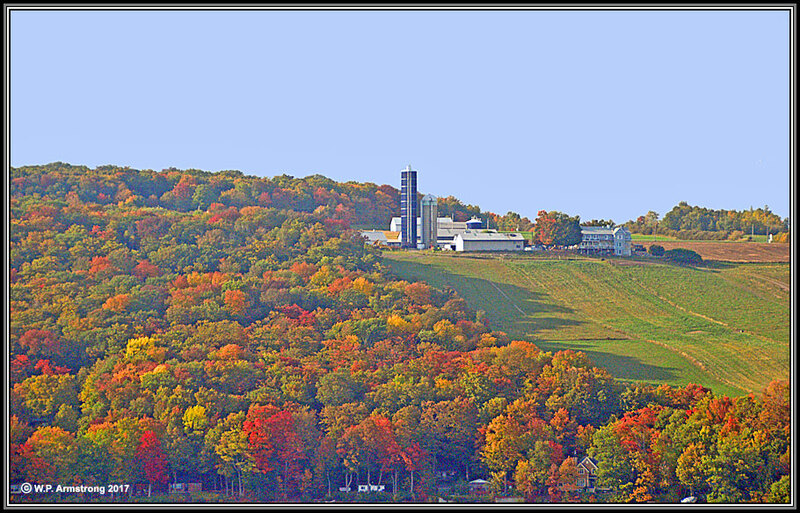 Unfortunately, the trip was about 2 weeks too early for the peak fall colors (red & sugar maples) in this lovely region of Earth. I must say it was somewhat difficult to keep up with our bus tour group while also searching for plants and ants! 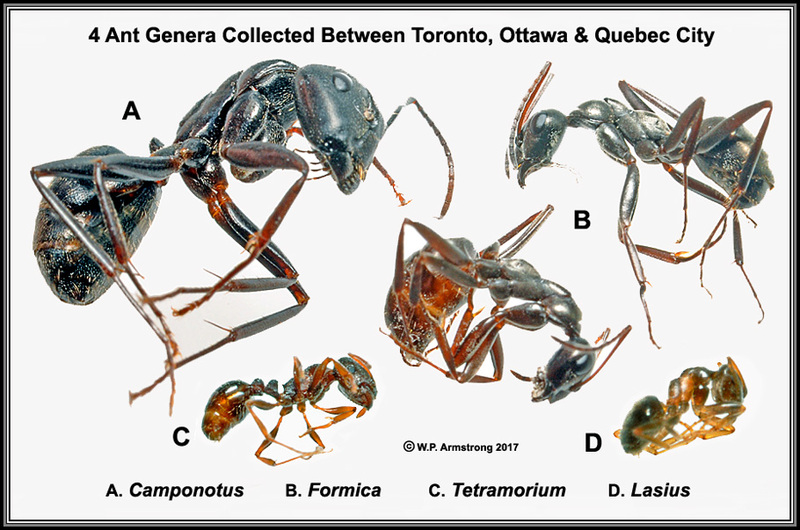 Pavement Ant (Tetramorium caespitum): A colony of this small, slow-moving European species was living in a planter at the approximate position of red arrow. It has a 12-segmented antenna with 3-segmented club, 2 propodial spines, and 2 petiole nodes. It is definitely a species that can survive very cold winters with permafrost. I also found it in 2015 near the metropolis of Sparks, Nevada. 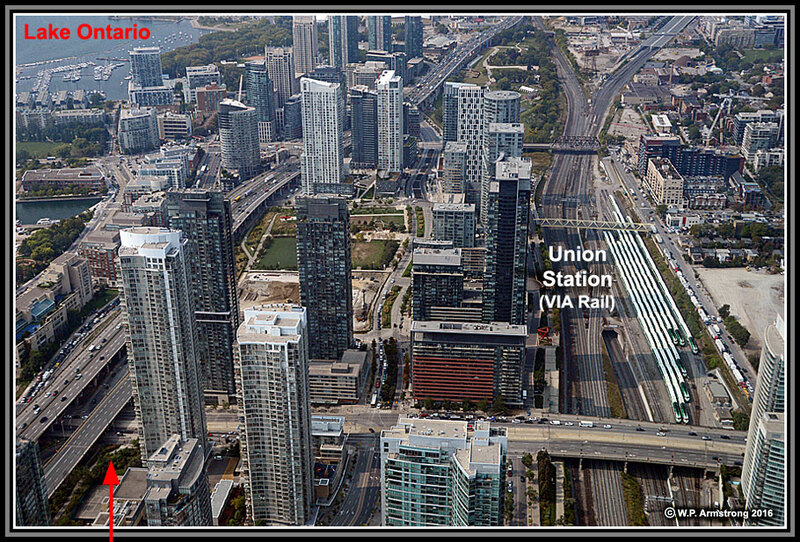 Image of city taken from top floor of skyscaper in downtown Toronto. My obsessive-compulsive detail of ants on this page is due to high blood levels of prednisone. By the way, many species in the genus Lasius (D) occur in the U.S. but I have never found this interesting species in my ant surveys of California & Arizona as of October 2017. 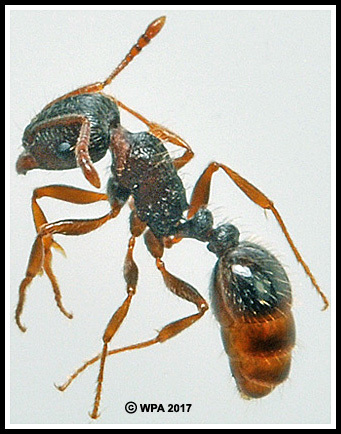 It is a small ant similar to Formica but has a markedly different-shaped propodeum when observed in profile view. Maybe I walked right past their nests without noticing them. Stay tuned! 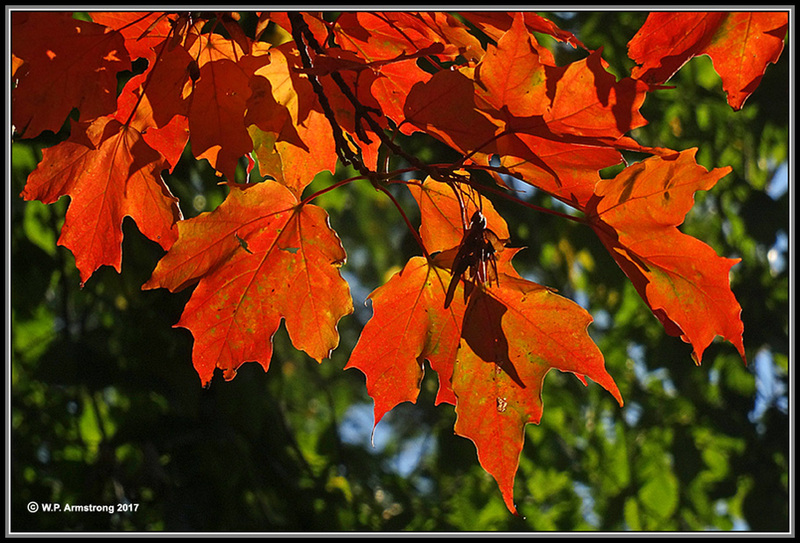 The following images are about the best I could do for fall colors (particularly maples). This is probably one of the best places on Earth for brilliant red fall colors; however, I was about two weeks too early. 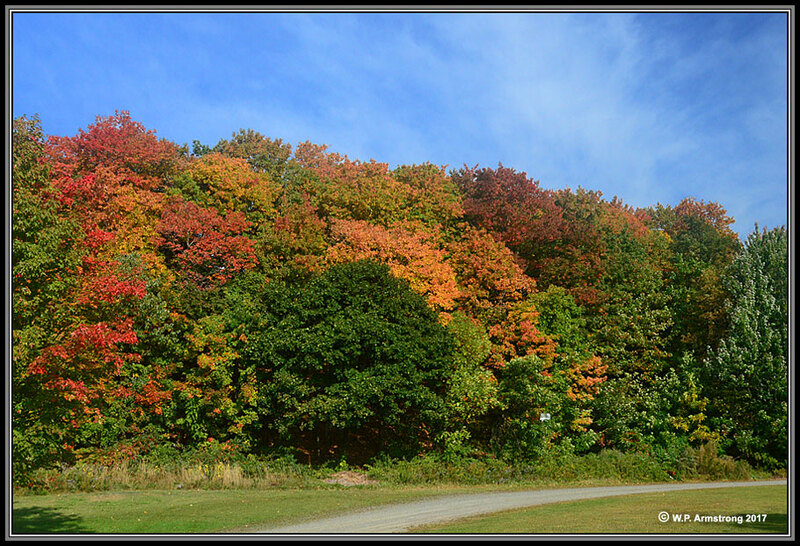 Imagine how this forest will look when all the red maples are in peak autumn color! Maple forest along country road: Montreal, Canada. Red maple (Acer rubrum): Photographed on Orleans Island (d'Orleans) in the St. Lawrence River just east of Quebec City. Sugar maple (Acer saccharum): Photographed on Orleans Island (d'Orleans) in the St. Lawrence River just east of Quebec City. Some Internet references state that the Canadian flag depicts a sugar maple (Acer saccharum) rather than the true red maple (A. rubrum). 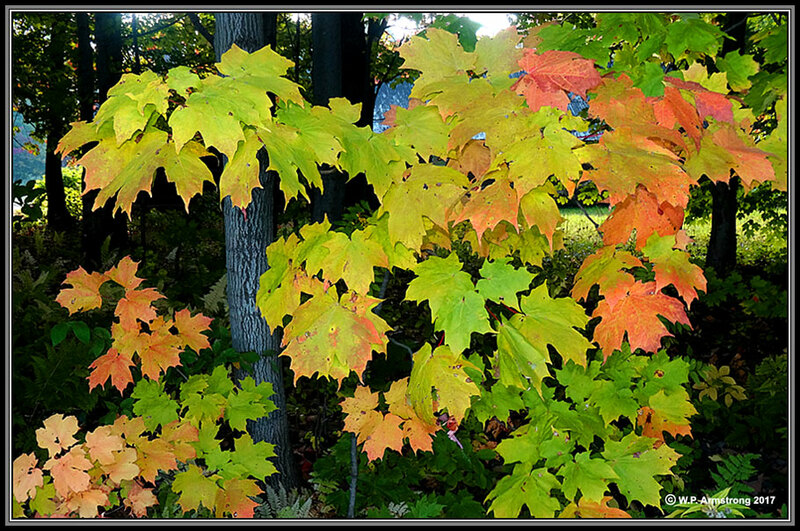 The general leaf outline also resembles some leaves of the variable red maple, but not exactly. 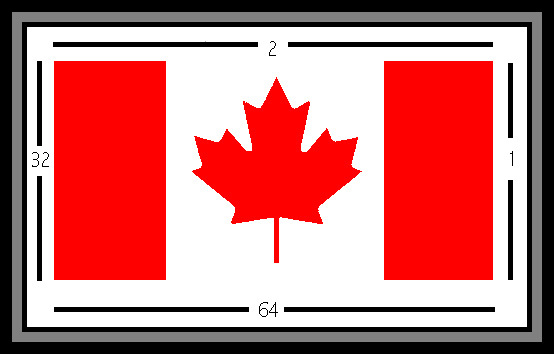 Here is the official Government of Canada website technical description: "The National Flag of Canada is a red flag, twice as long as it is wide (or 64 units in length and 32 units in width or depth, as shown in the accompanying diagram). In its centre is a white square the width of the Flag, with a single red maple leaf in the centre." What do you think? Compare the flag images with the above two images of both tree species (Acer rubrum & A. saccharum) from Orleans Island (21 Sept 2017). 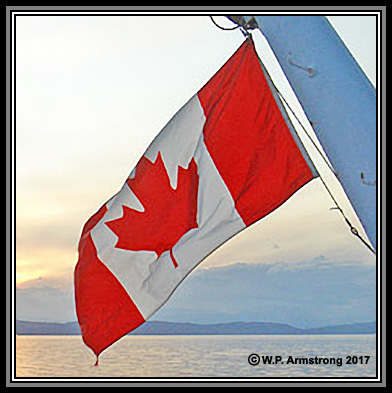 According to Wikipedia (accessed 9 Oct 2017), the leaf on Canadian flag is a highly stylized, 11-point maple leaf of no particular species. The number of points on leaf has no special significance. In fact, the number and arrangement of the points were chosen after wind tunnel tests showed the current design to be the least blurry of the various designs when tested under high wind conditions. Some authors assert erroneously that each point stands for a province and three territories; however, when the current flag was designed in 1964, Canada had 10 provinces and 2 territories. As a college botany teacher for 40 years, I have used floral formulas to help students learn the differences between different plant families. For example: 4-4-6 relates to the mustard family (Brassicaceae) with 4 sepals, 4 petals and 6 stames. Perhaps using the points and lobes on the Canadian flag is a way for educators to help students learn Canadian geography. On the current flag, three main lobes equates with the number of territories, but the number of points (11) exceeds the number of provinces. In conclusion, it is a bright red stylized maple leaf, with a general outline that resembles some leaves of the variable red maple (Acer rubrum), with 3 main lobes and 2 small basal lobes. But remember, I have also seen red maples leaves with inconspicuous or no basal lobes. It also superficially resembles some leaves I have observed from the sugar maple if you don't count the number of points. By the way, there are also red maple cultivated hybrids (cultivars) with other species, such as silver maple (A. saccharinum) which I am not about to discuss. The bottom line here is that it is a bright red, stylized maple leaf that looks great on the flag of a great country! 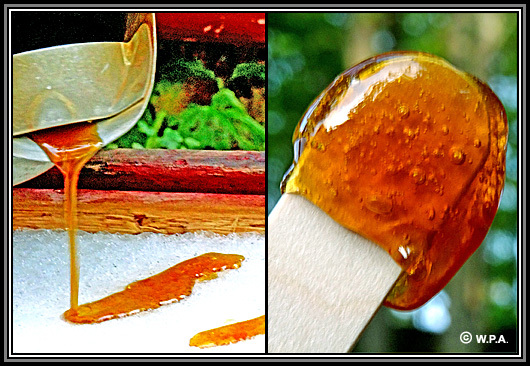 When the watery sap ("sugar water") of maple trees rises in early spring, it is tapped and boiled down into thick maple syrup. Approximately 10 gallons of sap makes one quart of syrup. Both red and sugar maples are tapped in Canada. In my opinion, the fresh syrup tastes better than honey! Why I love Canada: Canada is the 2nd largest country, and yet its population is less than California! It even has 6 time zones, from British Columbia to Newfoundland. Canada has 40% of the world's lakes & Ontario alone has about 1/3 of the world's fresh water. The Canadian Rockies are without a doubt the most beautiful place I have ever been. Now I have fond memories of the eastern part of this lovely country.